Yep, it's a Samsung Galaxy Note II. With T-Mobile branding. Indeed, there's not much that will surprise you when gazing upon the latest version of the quad-core Exynos-clad phone / tablet -- it's almost completely the same as the unit we reviewed earlier this week, not to mention the Sprint and AT&T models we've played with so far. Cosmetically, the only difference you'll notice is the Magenta branding on the back of the device. As you'd expect, this particular Note -- the T889 -- doesn't have any LTE compatibility under the hood, but instead offers support for 42Mbps HSPA+ on bands friendly to T-Mobile's network. Otherwise, the only thing that may catch your eye is the usual smattering of bloatware dedicated to Magenta's cause. We were a little disappointed to see that the Multi Window feature hasn't been added to the unit we played with tonight; we won't rule out the possibility of seeing it added into the final production firmware or shortly after in an OTA update. We still haven't been given pricing or availability (aside from being told it will be released in the coming weeks), though owners of the original T-Mobile Note will still be annoyed at how fast its sequel came out. Take a look at our images of the marble white and titanium gray version of the T-Mo Galaxy Note II below! 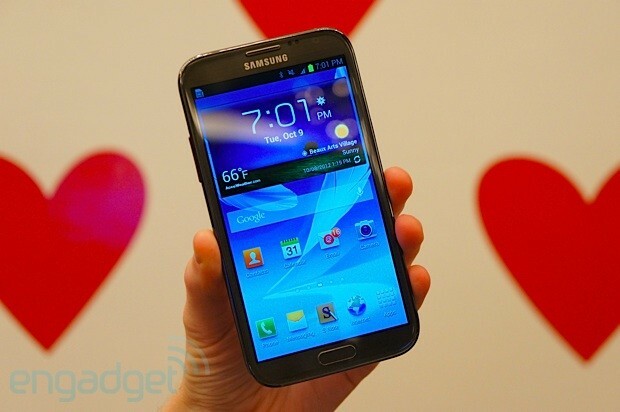 Samsung Galaxy Note II for T-Mobile hands-on originally appeared on Engadget on Tue, 09 Oct 2012 23:16:00 EDT. Please see our terms for use of feeds.